Pseudo-capacitive transition metal chalcogenides have recently received considerable attention as a promising class of materials for high performance supercapacitors (SCs) due to their superior intrinsic conductivity to circumvent the limitations of corresponding transition metal oxides with relatively poor conductivity. However, the important challenge associated with the utilization of such high-capacitive electrode materials is the development of desirably structured electrode materials, enabling efficient and rapid Faradaic redox reactions and ultra long-term cycling. Here, we propose a hierarchically integrated hybrid transition metal (Cu-Ni) chalcogenide shell-core-shell (HTMC-SCS) tubular heterostructure using a facile bottom-up synthetic approach. The resultant HTMC-SCS electrode exhibits a high volumetric capacitance of 25.9 F cm⁻³ at a current density of 2 mA cm⁻². 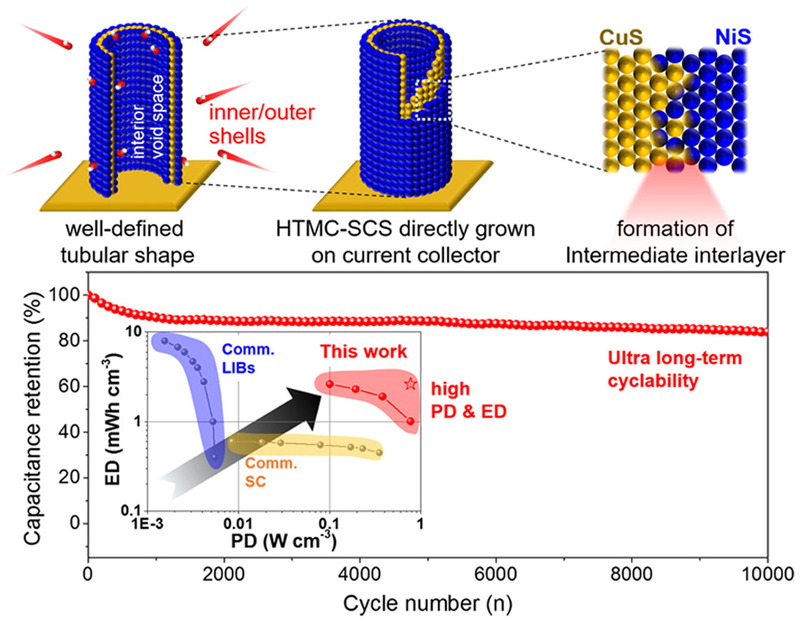 Furthermore, asymmetric SCs based on an HTMC-SCS heterostructured electrode demonstrate a high power density (770 mW cm⁻³) and an energy density (2.63 mW h cm⁻³) as well as an ultrahigh reversible capacity with a capacitance retention of 84% and a long-term cycling stability of over 10,000 cycles. Based on experimental results and density functional theory calculations, these remarkably improved electrochemical features are discussed and explained in terms of the unique combination of the conductive CuS core and active NiS shell materials, hierarchical tubular open geometry with nanoscale inner/outer shell structure, and mechanical stress-mitigating interlayer on shell-core-shell interface, allowing highly reversible and efficient electrochemical redox processes coupled with fast charge transfer kinetics and an electrochemically stable structure.